If you're new to Windows 8 (or Windows 8.1), you're no doubt battling the learning curve. And some areas aren't as intuitive as they could be, like trying to navigate your way to the PC Settings menu. In fact, Microsoft seems to make this extra-confusing. You may know that you can bring up the Charms Bar and click Settings (or even use the Windows-i keyboard shortcut), but you won't see PC Settings in the list of options up top or in the icons near the bottom. As it happens, the option is hiding in plain sight; look below the aforementioned icons and you'll see the option Change PC Settings. Why Microsoft stuck it down there instead of in the main list, I have no idea. The PC Settings menu. Getting there isn't half the fun. 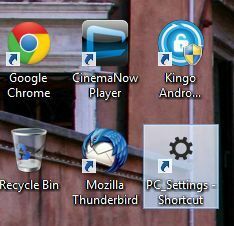 If you want an easier way to access PC Settings, one that doesn't require venturing into the Charms Bar or remembering a keystroke, the folks at 7Tutorials have an answer: a desktop shortcut to PC Settings. Simply download the Zip file, then extract it to the Windows desktop. Alternately, you can extract it elsewhere and create a shortcut that sits on the desktop. Or even in the taskbar if you prefer. It's a small convenience, to be sure, but also a nice one for folks who make routine visits to PC Settings and want a faster, easier way to do so.